Indira Gandhi has received praise for nationalising India’s banks in the 60s on account of the country’s stability in the world economic crisis. While many have criticised such praise, the arguments have been on a minor premise (that India is better off with liberalisation) rather than the major one (that nationalisation has actually helped stave off the financial crisis). There are several criticisms of Indian nationalised banks from anecdotal evidence. They are thought to be so risk-averse, due to the adverse consequences of losing public money, that not only are subprime loans out of the question, even good loans are severely scrutinised and, at the whiff of a doubt, rejected. They are said to be cash-rich not because of good decisions, but because they are not doing much with the capital that they have. With such a decision-making style that penalises risk-taking, nationalised banks are criticised for staying away from extending credit both to the deserving and the undeserving. The uncharitable would say that crediting the nationalised banks for their “conservative” approach is like crediting swimmers who did not drown because they were too afraid to jump into the water. However, in a 2007 speech at Yale University, the former Deputy Governor of the Reserve Bank of India (RBI), Dr Rakesh Mohan, had pointed out that the credit portfolio of nationalised and private banks “witnessed sharp growth in the period 2003-07” — over 25 per cent. If Indian banks are continuing to expand credit and hence not being “conservative” as claimed, and are not generating “toxic assets”, there has to be some other reason for their good fortune. I discovered this reason, much to my surprise, on a project with a banking software company where I got some first-hand insights into how Indian bankers make their decisions. Both nationalised and private banks are united in one aspect — they have both not used statistical and financial models to make lending decisions, and have stuck to the basics while relying on their intuition about the borrower. A big reason for this is that they did not have the expertise to use complex financial models. This turned out to be a blessing in disguise, as the tools of statistics and finance misled the US investment banks into making very bad decisions, given what they knew at the time. This lack of usage of statistical and financial tools could help explain why most Indian banks were spared from having “toxic assets”. Indian banks have thankfully focused on thinking about the uncertainty in each unique situation without resorting to obfuscatory financial models. What is the problem with statistics and finance? Classical statistics is dogmatic about restricting the analysis to past data and will not allow beliefs about the future to come in. Adapting an example from Taleb’s book The Black Swan, imagine the statistical goat that is fed for 500 days, and as each day passes, its belief about getting the next meal increases. Guess what happens on the 501st day — Bakr Eid! The day before the goat gets slaughtered, its belief about the future should be the highest given that it has the most data. Finance, to the extent that it relies on classical statistics, faces the same problem. For instance, a newspaper report that says Gurgaon’s water table will vanish in five years should send shock waves in a banker’s mind. It doesn’t take much to figure that if there is no water in five years, property will be worthless, and borrowers will start defaulting. The probability of default on Gurgaon loans should rise in the banker’s mind, regardless of what the historical data says. Traditional statistical models will pick this up only when several defaults actually start showing up in the data, by which time, the bank may be in the red. Instead of empowering the individual to think clearly about their decisions, finance focuses on supplying cookie-cutter formulae that are easy to apply, without verifying the validity of such formulae. This is borne out by the history of the US financial collapse, where, in addition to being pushed by the government to give out loans to those who couldn’t afford it, the conventional tools of finance systematically underestimated the risk (given what was known at the time) behind such loans using models borrowed from quantum mechanics (like the Black-Scholes option-pricing formula) that have not been proven to be valid in the world of decision-making. These models made strong assumptions about the past being irrelevant to the future and large losses and gains being next to impossible, thereby generating a false sense of being on middle ground. As some of these models had Nobel prizes in economics behind them, very few dared to challenge the approach. Those who did, like the provocative and hard-nosed trader-turned-author Nassim Taleb, got shouted out. The entire financial industry based its operational logic on such faulty assumptions and there was no diversity in the system. So, when that single system collapsed, all of them went down together, as Taleb had starkly predicted. 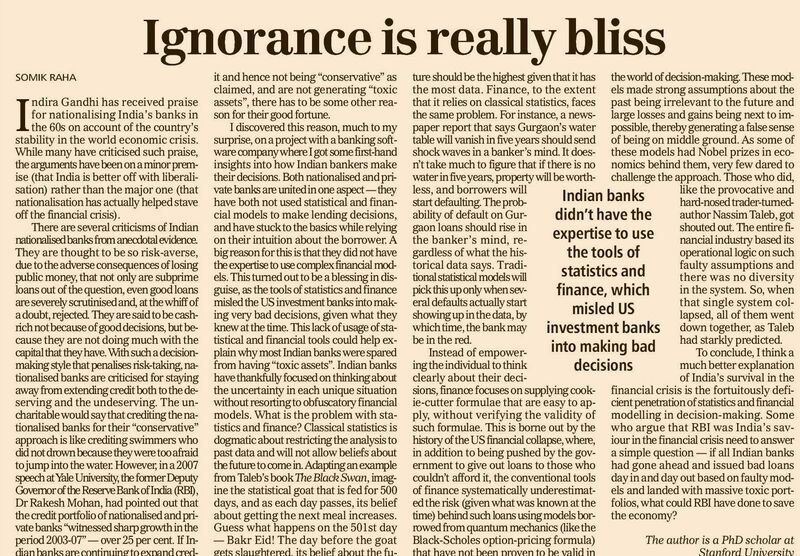 To conclude, I think a much better explanation of India’s survival in the financial crisis is the fortuitously deficient penetration of statistics and financial modelling in decision-making. Some who argue that RBI was India’s saviour in the financial crisis need to answer a simple question — if all Indian banks had gone ahead and issued bad loans day in and day out based on faulty models and landed with massive toxic portfolios, what could RBI have done to save the economy?